The incredibly blunt metrics that most planners or communities have used since the 1960s, like overall traffic congestion and on-time performance for transit, paint a grossly two-dimensional picture of the challenges people face while trying to reach jobs and services. They don’t provide sufficient information for agencies to make accurate decisions about what to build in order to best connect people to the places they need to go. These 1960s metrics lead to singular and expensive solutions (like highway expansions), while often failing to solve the problem or even creating new ones. Today, precise new tools allow communities to accurately calculate accessibility to employment opportunities, daily errands, public services, and much more. These tools allow states and MPOs to better understand where people are traveling and to design transportation networks to maximize the ability of people to travel. It also allows states and MPOs to optimize their transportation networks to utilize all modes of transportation and even to understand how their investments interact with land use policies. We use these tools all the time in our bus network redesigns, though we are limited, by available data, to studying access to jobs. It is great to see people working on better data layers to capture errands, shopping, and so on. I am not sure how much of this granularity is necessary, but it doesn’t hurt. Implicit in this news is the idea that ridership prediction could decline in importance, which would be great news. We are much too deferential to predictive algorithms for things that may not be predictable, such as human preferences and attitudes 20 or 30 years from now. There’s one other caution. When planning fixed infrastructure investment, hard thinking has to go into what facts from today are assumed to be permanent. For example, when we talk about access to public services, will we just analyze outcomes based on the often terrible locations of these services, thereby enabling continued terrible location decisions? If we dare to predict better urban form in response to public investments, on what basis will we predict that? The conversation about access therefore needs to reflect on what aspects of urban form and location are likely to last for decades, like the larger scale urban form and the likely trip generation it implies. (We may build more dense urban fabric, but we are unlikely to tear it down.) This is another reason why too much granularity could distract us; it leads us back into obsessive descriptions of the present, some aspects of which could be different next year. So this is difficult philosophical stuff. I’m trying to grapple with it in the next book. Feel free to nag me about how it’s going! Is Ride-Hailing to Blame for Rising Congestion? 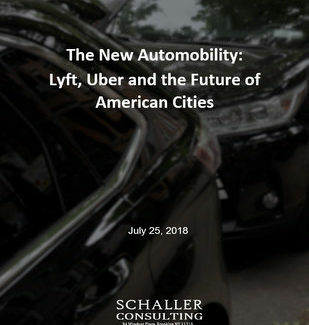 Throughout the past few years, the explosive growth of ride-hailing services such as Uber and Lyft have changed the landscape of urban transportation. Proponents of ride-hailing have long argued that these services benefit cities by reducing the need for people to own their own cars and by encourage them to use other transportation options, ultimately reducing the total vehicle miles driven in cities. TNCs added 5.7 billion miles of driving in the nation’s nine largest metro areas at the same time that car ownership grew more rapidly than the population. About 60 percent of TNC users in large, dense cities would have taken public transportation, walked, biked or not made the trip if TNCs had not been available for the trip, while 40 percent would have used their own car or a taxi. Schaller points out that on balance, even shared rides, offered by Lyft Line and Uber Pool, add to traffic congestion. Shared rides add to traffic because most users switch from non-auto modes. In addition, there is added mileage between trips as drivers wait for the next dispatch and then drive to a pickup location. Finally, even in a shared ride, some of the trip involves just one passenger (e.g., between the first and second pickup). [In major urban areas], taxis plus ride-hailing plus carsharing account for just 1.7 percent of miles travelled by urban dwellers, while travel by personal cars account for 86 percent. 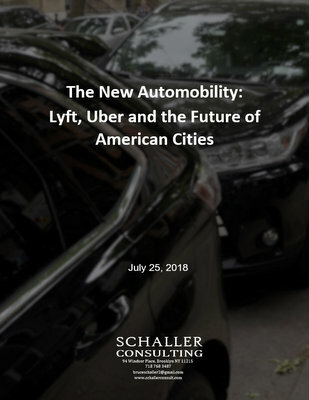 Chase contends that traffic congestion is not a new problem in cities and that ride-hailing is no more responsible for it than the personal automobiles that still make up the majority of trips. Special taxes, fees, and caps on ride-hailing vehicles are not the answer. My strong recommendation for cities is to make walking, biking and all shared modes of transit better and more attractive than driving alone—irrespective of the vehicle (personal car, taxi, or autonomous vehicle). Reallocate street space to reflect these goals. And start charging all vehicles for their contribution to emissions, congestion, and use of curbs. Some analysts argue for a more holistic approach that includes charges on all vehicle travel including personal autos, TNCs, trucks and so forth, paired with large investments to improve public transit. This is certainly an attractive vision for the future of cities and should continue to be pursued. But cordon pricing on the model of London and Stockholm has never gone very far in American cities. Vehicle mile charges have been tested in several states, but implementation seems even further from reach. Yes, ideally, we would aim to charge every vehicle for precisely the space it takes up, for the noise it creates, and for the pollution it emits, and to vary all that by location and time-of-day. However, we have to start with what’s possible. Ultimately, the most scarce resource in cities is physical space, so when we allow spatially-inefficient ride-hailing services to excessively grow in our densest, most urban streets, we risk strangling spatially efficient public transit and fueling a cycle of decline. If we are to defend the ability to move in cities, we have to defend transit, and that means enacting achievable, tactical policies even as we work on building the coalitions needed for bigger change. Reasonable taxes or limitations on TNCs are one such step. Finally, these interventions should really be locally-focused, because like all urban transportation problems, this one is extremely localized. Lyft wants us to think of them as feeders to transit, which is a fine idea. But what is actually profitable to TNCs is to swarm in the densest parts of cities, increasing congestion and competing with good transit, and that’s where they do net harm. Lyft and Uber knows where every car is at every moment, so it would be perfectly possible to develop cordon-based surcharges to focus any interventions on the actual problem. Otherwise, it will be easy to say that by restricting TNCs in Manhattan we’re keeping someone in outer Queens from getting to the subway, which is not the point at all. This map takes the travel time methodology regular readers of this blog know well, but then within that area of access shows all of the jobs, categorized by sector, as a dot density map. The effect is to visualize the quantity and number of jobs that can be reached from a give point in a given time, by walking, transit, cycling, or driving. The map is also able to quickly calculate the number of jobs inside the AM peak travelshed on the fly, and even allows the user to toggle on and off different job classifications. If you want to see all of the education jobs within a 30 minute walk of a given location, now you can. 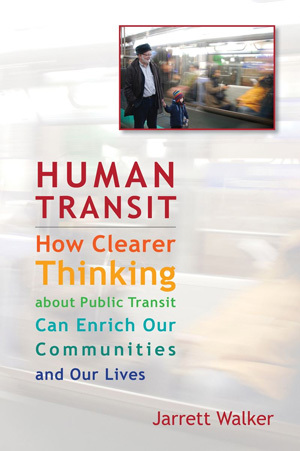 Helping people and organizations understand the transit consequences of where they choose to locate, and thus to take more responsbility for those consequences. This, over time, can help people who value good transit to locate where transit access is good — something that's very hard to discern from a typical bus map but that becomes very obvious here. You can even assess access to specific things that you value, based on exactly where the blobs are. Helping people visualise the benefit of transit — access to your city — as a freedom, and thus to understand more clearly what transit does for them. It broadens the narrow notion of travel time – which is often understood for only one typical trip — into a picture of your options for accessing all the things you value. The percentage of a city's resources (jobs, housing, retail etc) that is in the blobs for a particular location could also form the basis for a meaningful Transit Score that could replace the technologically biased scores now used by WalkScore.com. Another report from USPIRG on the decline of driving in US cities is out today. Transportation in Transition: A Look at Changing Travel Patterns in America's Biggest Cities combs through secondary data to assess changing mobility patterns. The big picture is clear: in nearly all of America's major cities, less driving is happening, as measured by miles traveled, journey-to-work mode, or share of work done from home. The proportion of residents working from home has increased in 100 out of the 100 largest urbanized areas since 2000. The proportion of households without cars increased in 84 out of the 100 largest urbanized areas from 2006 to 2011. Of course, the canned response to data of this sort is to attribute it entirely to the 2008 recession and its knock-on effects on personal income and unemployment. USPIRG's analysis seems to refute this idea, finding that unemployment in the 15 areas with the greatest declines in VMT actually increased less from 2006-2011 than in all other cities. The same holds true for declining income and increasing poverty. The bottom line is that in the cities where mobility patterns are changing most intensely, this shift cannot be handwaved away by pointing to the recession. Previously noted: USPIRG's report on the correlation of the market penetration of mobile communications technology and decline of driving. are smartphones changing the geography of our cities? The increasing prevalence of mobile communications technologies has important consequences for urban transportation. The new ability to carry your social life around with you, enabling instant connections regardless of physical location, has the potential to reconfigure how we think about time and mobility, and in turn how we build environments to suit our travel behavior. For example, it appears to be impossible to use smartphones safely while driving, so smartphone users have a motive to seek an alternative mode so that they can make use of their travel time. Ben Schulman has an interesting take on this in his paper, The Car as Smartphone: Effects on the Built Environment and Sociality, which you can download below. He places the smartphone in a continuity of change in human communications technology, and traces how those technologies have helped to shape our cities. The built environment then is a reflection of the predominant communication devices being used at given points in time that shape sociality. In other words, we develop an infrastructure necessary to accommodate the needs of our preferred communication tools. This idea is a larger envelope around the familiar idea that all cities are built around the transportation technologies of the time. Transportation, after all, is one kind of communication tool. There is a lot of to digest here, but it is well worth a read in order to situate these trends within an academic urbanist frame of reference. My take is that the role of communication is hugely important, but must be understood as an aspect of a broader web of economic and social relationships which together work to produce the space of the city. why are americans driving less? better communication options! Over the last 15 years, the Internet and mobile communications technologies have transformed the way Americans live and work. During that same period, growth in [motor] vehicle travel slowed and then stopped, with Americans today driving about as much on average as we did in 1996. USPIRG has a new report out today, focused on how network technology has ushered in new possibilities for Americans’ personal mobility. Modern communications are beginning to alter the types of trips people need to make, as more and more people work remotely for at least a portion of their working hours. The mobile, high-speed, GPS devices that a majority now own are absolutely necessary to the cellphone trip planners and various -sharing systems that have spread to many US cities in recent years. This is one of the most compelling arguments for why we should expect America’s declining interest in cars to be permanent. The “decline of cars” story is a hard one to convey to the currently ruling generation (now in their 40s-70s). Older folks too easily assume that Millennial disinterest in cars has something to do with being young and single and childless and maybe poor. We already knew that Americans are getting drivers licenses later and later in life — and this statistic ought to get attention because it’s comparing Millennial behavior to that of their parents at the same age. The strongest story, though, presents not just a trend but an explanation of it, and that’s what we have here. Communications technology explains why the younger generation is finding cars less necessary (and why older people who are good at technological uptake are finding the same thing). People still need to be together (see Yahoo’s recent decision to abolish telecommuting) but communication technology is replacing a lot of errands that the older generation is used to doing with cars. completed effectively without a car. The report also discusses mobile ticketing, perception of travel time, and each of the various sorts of sharing services, and provides a set of policy recommendations to respond to and build upon the potential of this technology. Read it yourself here. Helping people visualise the benefit of transit — access to your city — as a freedom, and thus to understand more clearly what transit does for them. It broadens the narrow notion of travel time – which is often understood for only one typical trip — into a picture of your possibilities as a transit rider. The percentage of a city's resources (jobs, housing, retail etc) that is in the blobs for a particular location could also form the basis for a meaningful Transit Score that could replace the technologically biased scores now used by WalkScore.com. The original tool is a beta buried deep in WalkScore's archives. It's basic and very, very slow. Initial wait time is excluded. Some timing of transfers is assumed, based on the author's experiences in Europe. So he uses an average transfer wait time of 1/3 of the headway instead of 1/2 of the headway, which would be appropriate for random transfers. Here's the problem. Both assumptions mean that Mapnificent's assumptions undervalue frequency and overvalue vehicle speed. Since this conceptual bias is already very, very common (see Chapter 3 of my book), Mapnificent is seriously misleading in a way that can be really unhelpful. For cities that I know, especially area with lower frequency service, Mapnificent wildly overstates the convenience of transit, and fails to show how locating on frequent service will get you better access to the city. In my network design course we talk about this. When figuring travel times in the course, I insist on using 1/2 of the headway as the intial wait time and the same as the transfer time (unless there's a pulse) so that frequencies weigh heavily into true travel times, as they do in life. This sometimes sounds silly: If a route runs once an hour does that really mean I wait an average of 30 minutes? Or do I just build my life around the schedule? I view the two as the same thing, really. We're not describing literal waiting so much as time when you're in the wrong place. We're describing the difference between when you need to arrive and when you can actually arrive. This could take the form of arriving at work 29 minutes earlier than your shift starts — consistently, every day. Effectively, you end up waiting at your destination. So there are a range of judgment calls to be made in designing these things, but it's worth getting it right because the potential utility of this tool is so significant. The good news: I'm involved with people who are working on something better. Stay tuned! portland: the grid is 30 years old … thank a planner! Thirty years ago next week, on Labor Day Weekend 1982, the role of public transit in Portland was utterly transformed in ways that everyone today takes for granted. It was an epic struggle, one worth remembering and honoring. What did it look like before 1982? Here's a bit of the 1970 network (full map here). The 1970 network consisted of bus routes radiating from downtown across the gridded eastside, which constitutes about 3/4 of Portland. If you were anywhere on this network, you had a direct bus downtown — a slow, circuitous, and infrequent bus. Very few routes ran better than every 30 minutes during the day. Only two routes ran north-south across the east side, and both were too infrequent to transfer to, so you couldn't really use them unless both ends of your trip were on them. How did the 1982 network transform the possibilities of mobility in the city? The old network was solely about going downtown. The new network was about going anywhere you wanted to go. The old network was infrequent. The new network required easy connections, so it was designed to run at high frequency (most lines every 15 minutes or better all day). Remember: Frequency is freedom! The old network was wasteful, as many overlapping lines converged on downtown. The new network was efficient, with little overlap between lines, and with lines spaced further apart to the extent that the street network allowed. This is how the resources were found to increase frequency so much. The old network was complicated, with routes often zigzagging from one street to another. The new network was simpler, easy to keep in your head. Many streets that were formerly served by a patchwork of overlapping routes, such as Division, now had a single route from end to end, so that you needed only remember "the Division bus." Transit became an intrinsic part of the street. If you're in a hurry, skip to "Thank a Planner!" below. But if you have a couple of minutes, let's explore more deeply how the grid transformed Portland, and why it was so controversial at the time. In both maps above, that wavy line across the middle of eastside Portland is the Banfield Freeway, where the first and backbone line of the MAX light rail system runs today. In the 1970 image, look for the line marked "1" extending north from the Banfield in the middle of the image. This is NE 42nd Avenue (a bit of which is labeled 41st, but don't let that distract you). In the old network the bus line along 42nd came from the north edge of the city, once an hour. Partway down it merged with another branch, to form 30-minute frequency. When it approached the Banfield, it turned west and zigzagged into the city via the Lloyd district. Once it turned west off of 42nd, it was duplicating other routes the whole way. If you wanted to go somewhere else on the eastside, the bus was not much use. Frequencies were poor so it was very hard to make a trip involving multiple routes. If you lived on NE 42nd in 1982, you were confronted with massive change, the sort of change that makes people scream. Never again would you have a direct bus to downtown Portland. Now you would be on the new 75, which would run continuously north-south all the way across the city. And if you wanted to go downtown, you would have to transfer (as we called it in those days). But on the bright side, the 75 would run every 15 minutes, so transfering wasn't hard. And in return, you got all the other benefits of a frequent routes that would let you connect quickly to reach destinations all over the east and north sides of the city, without going downtown. This is always a tough sell, because many people value transit only for the commute downtown. These people tend to complain when the network is optmized to serve many kinds of trip at once, which is exactly what the grid does. A frequent grid is the ultimate in versatility, equity and freedom. It does not pick favored destinations for favored markets. Instead, it delivers anywhere-to-anywhere mobility for wherever you might want to go. Today, the non-downtown elements of the grid, especially 72 and 75, are among TriMet's most productive lines. If the 1983 and 1986 restructurings had not happened, LRT would have been a competitor with the CBD-focused, poor quality parallel bus routes that already were there, and there would have been no high quality bus routes intersecting the LRT at right angles. Portland would have enjoyed much less patronage than it has since experienced on both its LRT and bus routes. Where did all the money for the new high-frequency crosstown lines come from? Removing duplication. Look again at the your ride on 1970's route 1. Once it turned west off of 42nd, it duplicated other routes the entire way into downtown. Now look closely at the routes approaching downtown from further south in the old map. They ran on so many closely-spaced parallel streets that they were effectively duplicating one another as well, wasting service. The grid plan found many resources by removing these duplications and moving to wider and more consistent spacing of lines across the whole city. In the same process,the grid introduced the idea that it's OK to walk further to a more frequent and useful service — the foundation for transit's link with walking (and with all of walking's public health outcomes) today. The grid was also a radical simplification, making it easier for people to keep the network map in their heads. Now, bus lines would often follow the same street from end-to-end, so you could remember easily that there's a Division Street bus, say, and an 82nd Avenue bus. In the old network, if you wanted to go from 20th & Division to 82nd & Division, you had to go downtown and back, because these two parts of Division were covered by different routes. The beauty of the grid is that your transit directions are sometimes as simply as walking or driving directions: "Take the Division bus out to 82nd, then take the 82nd bus south." The transit lines are just part of the street. Imagine, in 1982, the struggle involved in implementing this. Vast numbers of people lost their direct bus to downtown, at a time when going downtown seemed like the only purpose of transit to many existing riders. Transit agencies tend to listen most to their existing riders, who have adapted their lives to the system as it is, so it takes real courage for them to seek new markets instead of just catering to the existing ones. Imagine the disruption, the rage, the recriminations, not to mention the apathy from people for whom buses just don't matter, no matter what they're achieving. Ken Zatarain, who was a TriMet service planner at the time and who is still at the agency. Thank him at: zataraik AT trimet DOT org . Thomas G. Matoff, the single most important mentor in my own transit career, and probably the critical player in pushing the grid through. Tom, who was service planning manager and thus Ken's boss, was an eloquent, passionate and persistent advocate for the grid both inside and outside the agency. He was the first person I've met, and one of the few I've known, who could convey how essential network design is to the life, joy, and prosperity of a city. Tom went on to be General Manager of Sacramento Regional Transit and is now working on the Sonoma-Marin rail project in California. Thank him at: tmatoff AT sonomamarintrain DOT org . say something on Twitter with the hashtag #PDXGrid . You might also ask the two mayoral candidates about how important the frequent grid is to their vision of the city, and whether they think it should be enhanced. Why does this matter? Because even today, there's disagreement in Portland about important the frequent grid is, or even whether a complete everywhere-to-everywhere network (which requires high-frequency buses as well as rail) should be a priority at all. Some view the grid as unimportant, for example, because they view bus service as unimportant. Purists might argue that the grid never made it to its 30th birthday, but rather perished at 27 in 2009. That was the year that TriMet cut all-day frequencies below the 15-minute threshhold that is widely accepted as the definition of "frequent enough that you can use it spontaneously, without building your life around the timetable." Since the grid relies on easy connections to achieve its goal of easy anywhere-to-anywhere access, the 2009 cuts began to undermine the whole idea of the grid. TriMet avoided doing this in its first round of cutting after the crash, but felt it had no alternative in the second 2009 round. Will the grid ever be restored to its necessary frequency? Will it ever be expanded and enriched (as regional land use planning generally assumes it must be) with even better frequencies? Not everyone in Portland thinks this is a priority, so you might want to express your view. More on the history and spectacular outcomes of the grid if you click below. But even if you don't click, thank a planner! "[The U.S. Federal Transit Administration (FTA)] believes improvements to both access and mobility are key features of a good transit investment. FTA agrees a measure that defines accessibility instead of mobility might be a better representation of the kind of benefits transit projects are intended to produce. As noted, however, it has proven very difficult to measure. Although it is relatively easy to specify a measure such as number of jobs within a specified travel time of a single location, creating a broader corridor or regional measure including calculations to and from multiple locations is more difficult and complex. FTA believes a measure focusing on project ridership will indirectly address access improvements since more people will ride a project that has enhanced access to jobs or other important activity centers. Focusing on the way a transit project can enhance an individual’s ability to get places, rather than just travel faster, is a desirable outcome of the evaluation process. FTA intends to continue to explore how best to do so." a move that Socrates* had some questions about. This is indeed hopeful. I'll lay out a fuller argument on how this agenda might move forward in a coming post. Question: When FTA refers to the difficulty of aggregating accessibility measures for everyone in a region, do you think they're referring to a logical problem (i.e. the stated task is logically or philophically incoherent), or a data availability problem, or some other kind of problem? It certainly shouldn't be a processing power problem anymore. * To anyone who suggests that I'm being grandiose in assigning my own thoughts to Socrates, I can only reply that (a) the dialogue in question is broadly consistent with Socratic method, which is Socrates's primary legacy, and (b) Plato made quite a successful career of ascribing his own ideas to Socrates, including many that were not at all consistent with Socratic method, and he doesn't seem to have come to much moral/karmic harm. As long as a fiction is obviously a fiction, it's not lying, it's metaphor.